Product Description: Cranberries are a well-known source of abundant flavonoids and other bioactive components. There are several distinct classes of flavonoids found in cranberries, all with antioxidant properties and each having potentially unique physiologic functions. Cranberry flavonoids include anthocyanins, the pigments that give cranberries their rich red color, flavonols, and proanthocyanidins. Of particular interest to researchers, proanthocyanidins isolated from cranberries exhibit an anti-adhesion effect. 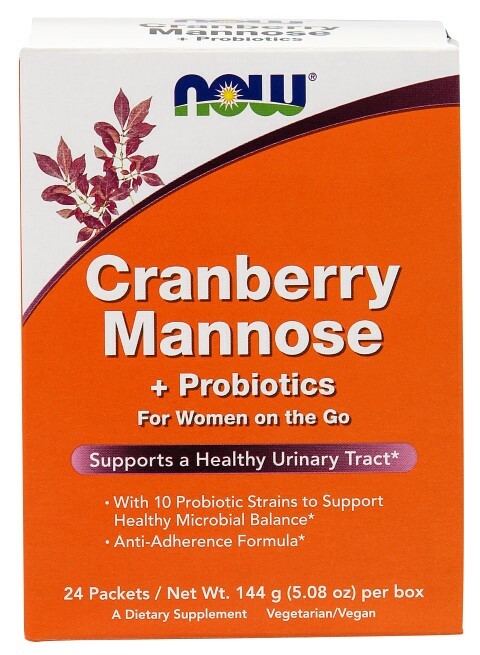 This anti-adhesion effect is the mechanism by which cranberries help maintain urinary tract health. Cranberry proanthocyanins are easily absorbed by the digestive tract and excreted in the urine. The presence of these compounds in the urine helps to cleanse the waste stream. * D-Mannose is a simple sugar that occurs naturally in some plants. Although small amounts of D-Mannose are metabolized by the human body, most of it is rapidly excreted in the urine. Similar to proanthocyanins, it exerts an anti-adhesion effect in the urinary tract that allows waste products to be flushed out in the urine. Because insubstantial amounts of D-Mannose are used by the body, it does not interfere with healthy blood sugar regulation. This dual anti-adherence formula also contains probiotic bacteria that help to maintain healthy microbial balance. * Supports a Healthy Urinary Tract Cleanses the Urinary Tract With Probiotics to Help Maintain a Healthy Microbial Balance* No Artificial Colors or Flavors A Dietary Supplement Vegetarian-Vegan Product. Xylitol, Natural Cranberry and other Natural Flavors, BetterStevia™ [Certified Organic Stevia Extract (Leaf)], Silica, Citric Acid, Tartaric Acid and Malic Acid. Suggested Usage: As a dietary supplement, empty 1 packet into 4 to 6 oz. of water. Use 1 packet 1 to 3 times daily. Ingredients: Xylitol, Cranberry and other Natural Flavors, BetterStevia [Certified Organic Stevia Extract (Stevia rebaudiana) (Leaf), Silica, Citric Acid, Tartaric Acid and Malic Acid. ** At the time of manufacture. Caution: For adults only. Consult physician if pregnant/nursing, taking medicationi, or have a medical condition. Keep out of reach of children. Contains Xylitol, do not feed to pets. Store in a cool, dry place after opening. Please Recycle.